My 4th great-grandfather by way of my father’s mother’s mother’s mother’s father’s father (makes your head spin, doesn’t it?) was Edmund Jean. That’s a long way back and it is oftentimes difficult to find documentation to support the life of a person who lived in the early years of our country. 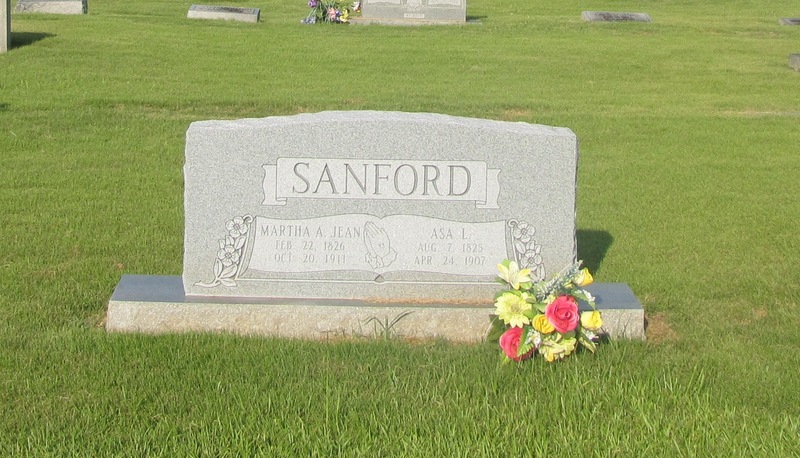 Fortunately for me, my great-great-grandmother, Martha Ann Jean, married into the Sanford family of Alabama and they have researched that clan reasonably well. Additionally, an attorney from Colorado who was a Jean descendant has researched the Jean line. In both instances, I have been given access to their work. Edmund’s parents were William Jean and Huldah Brown. He was born about 1755 in Brunswick County, Virginia. According to the U.S. Revolutionary War pension application files of two of his brothers, I know that his father William was an Episcopal minister who lived in Brunswick County until about 1772 when the family moved to Bute County, North Carolina in a section that became Warren County in 1779. Adjacent counties were Stokes, Surry, Guilford and Franklin and members of the Jean family resided in all of them. About 1776, Edmund married, although we do not have any information on his wife, other than the fact of her existence by way of names of their children. They had nine known children, the first being Wiley who was born about 1777. There was a gap in the ages of their children between 1778 and 1783; this gap could be accounted for by as yet undiscovered or deceased children or perhaps by Edmund’s service in the Revolutionary War. An 1818 act of Congress established a pension for soldiers who had served during the Revolutionary War and two of Edmund’s brothers applied for pensions. Since Edmund died before that time, he was unable to apply but it seems reasonable and likely to surmise that he did serve and the gap in children may support that supposition. There is a 1790 census for Guilford County, North Carolina that likely represents Edmund, although the name appears to be Edward; however, there is not an Edward Jean listed within the known children of William and Huldah, and the 1790 census lists as neighbors, William, Sr. (his father), William Jr. (his brother), and Philip (his brother). The family has one male over 16 (which would be Edmund), 5 males under 16 and 5 females (one of which would have been the first wife), which would indicate there is an, as yet, unidentified female child, plus one slave for a total household of 12 people. Edmund married again on October 2, 1795 to Martha “Patty” Beasley. This marriage leads to a supposition that Edmund’s first wife died, probably in childbirth since David Elroy Jean was born in 1795. Edmund was about 40 years old and Patty about 21 when they married. They had four children, the first of whom was my great-great-great-grandfather, John Jean, born in 1796. A land transfer record dated December 13, 1797 named Edmund Jean and William Jean as Trustees to oversee one acre of land donated to Love’s Methodist Church. In addition to learning the family moved from Virginia to North Carolina, his brothers’ pension files also mentioned the fact their father was an Episcopal minister and that William was a Methodist minister [some families have Edmund listed as Rev. Edmond Jean but I have not yet found any support for that assertion]. The land transfer record does indicate Edmund was at least active within the church. The 1800 census for Stokes County, North Carolina enumerates Edmund and his brothers William and Joseph as neighbors. Edmund’s family consisted of four males under 10, two males 10-15, one male between 16 and 25 and Edmund who was over 45 plus 1 female under 10, two females 10-15, one female between 16 and 25 and Patty who was between 26 and 44. Edmund died in 1802. There seems to have been no will and since he was only about 47 years old, it seems reasonable to assume his death was unexpected. I have as yet found no burial records to indicate where he was interred. It is possible, since he and William were Trustees at Love’s Methodist Church in 1797 that he is buried there. John Jean is my great-great-great-grandfather – my paternal grandmother’s grandmother’s father. He was born about 1796 in Stokes County, North Carolina to Rev. Edmund Jean and his second wife, Martha ‘Patty’ Beasley. According to a private book written by Glenn Jean, an engineer from Boulder, Colorado, John’s father died about 1802. The family was still in Stokes County for the 1810 census but by the 1820 census, both John and his mother were in Lincoln County, Tennessee. John married Ann Jane Shaw about 1817 and they began growing their family. 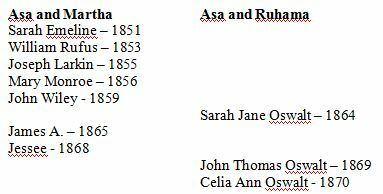 They had at least nine children: William Edmund (1820); Francis Marion (1821); unknown daughter (1823); Jessie L. (1825); my great-great-grandmother Martha Ann (1826); John Wesley (1828); my great-great-grandfather’s first wife Sarah (1830); David C. (between 1831 and 1833); Thomas Asbury (1836); Wiley H. (1837); and Elizabeth A. (1842). John was widowed about 1845 when Ann died, and he married a second time on December 24, 1846 to a widow named Martha ‘Patsy’ Taylor who had at least four children. 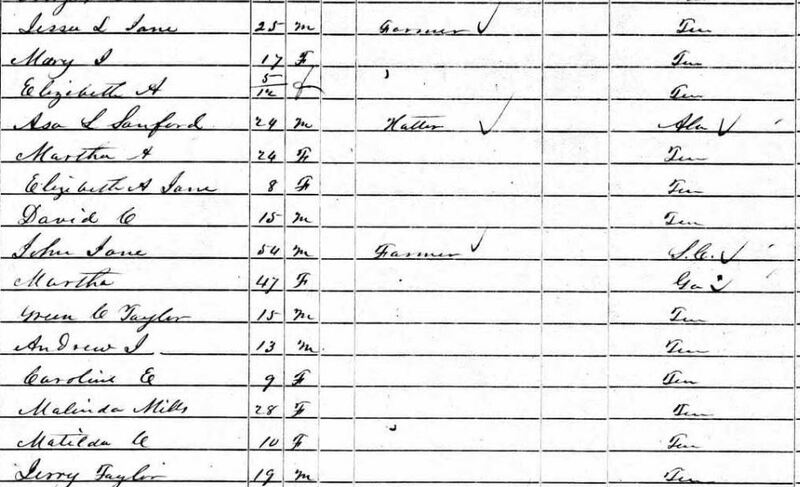 John (64) and Martha (57) were enumerated across the Alabama state line in Madison County, Alabama for the 1860 census. John’s occupation was listed as a Cooper. A cooper is a person who makes or repairs wooden barrels, casks or tubs. John had previously been listed as a farmer. They were back in Lincoln County, Tennessee for the 1870 census. He was, once again, listed as a farmer with personal property of $500. Sometime between 1870 and 1880, John’s second wife, Martha, died. 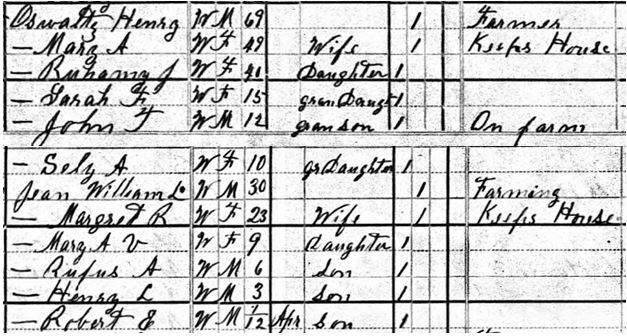 By the 1880 census, John, 86, was enumerated with his son Wesley’s family. John died about 1883. I have not yet found any burial information for John or either of his wives but the location is presumed to be in Lincoln County, Tennessee. (1) Land Deed Genealogy of Lincoln Co., TN, 1818-1828, Vol 2, Compiled by: Helen C & Timothy R Marsh, Southern Historical Press, Inc, Greenville, SC 1996.